Hi, it’s Stretch Tuesday time with the BugDoc. I’ve been watching with considerable interest the discussions about the top pieces in various colors. I’ve looked through my library of images and confirmed that I can’t find any evidence of a peach opalescent piece of stretch glass! I found a couple of Dugan/Diamond marigold pieces with stretch and some minor patterns, but no opalescence! 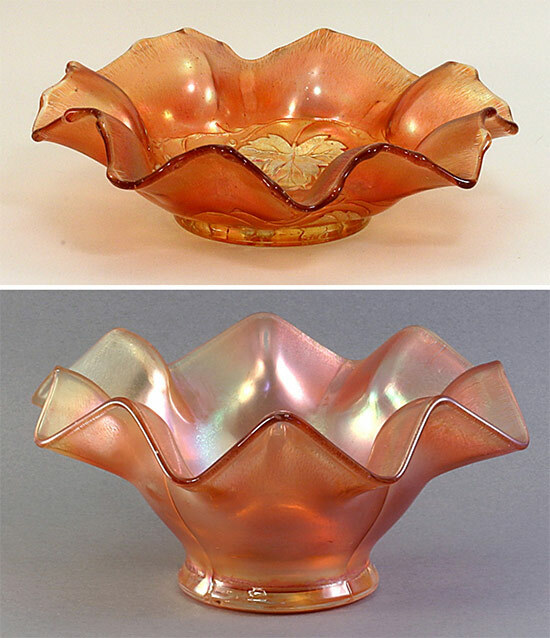 Here is a crimped bowl with a grape leaf interior and another bowl that is completely plain except for a flower design in the marie (inside the base). I think that these may be some of the earliest pieces that Diamond made with the stretch effect. They aren’t especially rare, but the stretch effect is always very fine which suggests that the pieces were most likely shaped, doped and simply reheated. This would account for the very fine and even stretch effect. 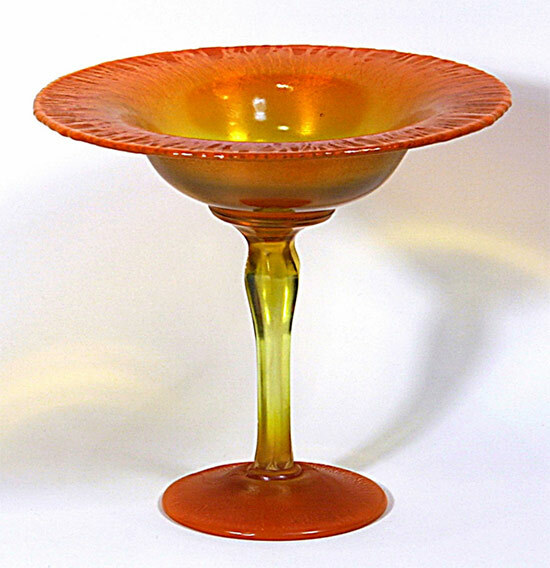 The primary pieces that can have an opalescent effect are Fenton’s Tangerine pieces. This is a striking color and it appears that some of the batches had proper chemistry for not only striking the orange color, but also achieving some opalescence. 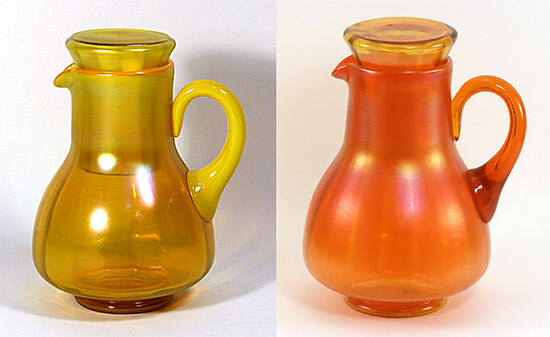 Like opalescent pieces, the amount of opalescence depends on the amount of cooling and reheating times. 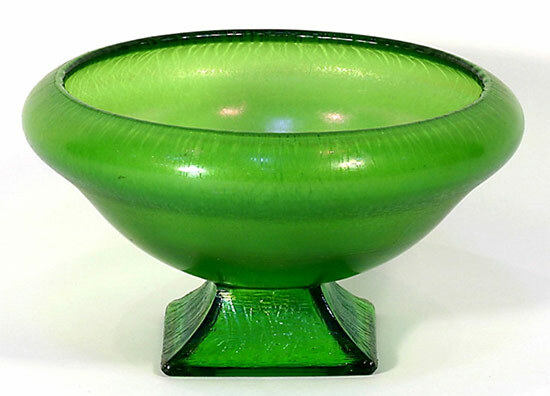 Here is Fenton’s #260 comport and you can easily see the opalescence around the top rim and the basal rim. And, here is the same comport that struck tangerine really well, but has virtually no opalescence. As another example, here are two #200 guest sets. The first one has a nice, clean orange striking and the second one has opalescence, especially the applied handle that is completely opal! 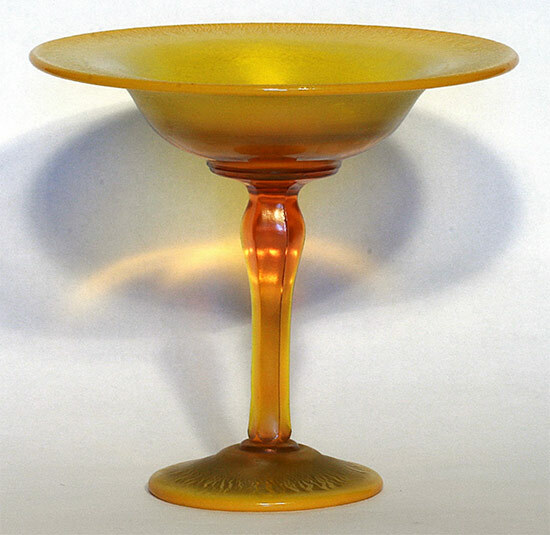 I’ve also noted that one of the Fenton twin-dolphin, square comports has a fine opalescent rim. I also had to drool over some of the emerald green pieces shown recently. This color is pretty rare in stretch glass with Northwood being the producer. Because of the few pieces known, this was probably made for a very short time – bummer! 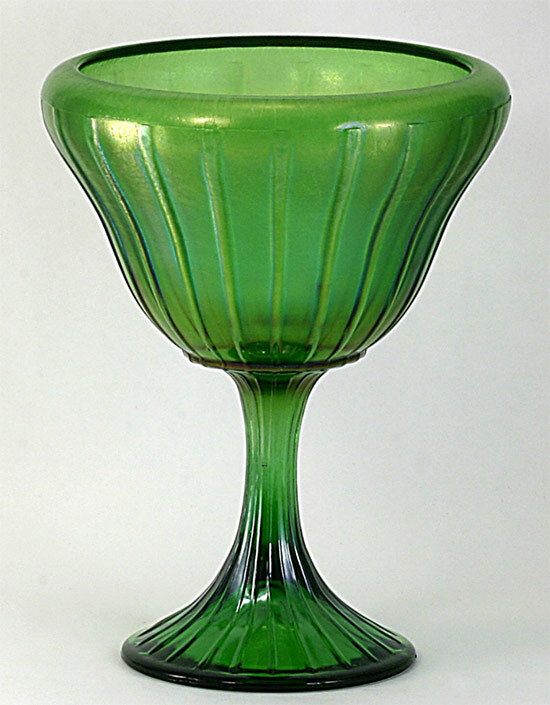 In their late production period, Fenton made quite a few pieces of emerald green stretch. Here is an image of one of the #637 comports (cupped in) and square-footed ‘tree-of-life” bowls. 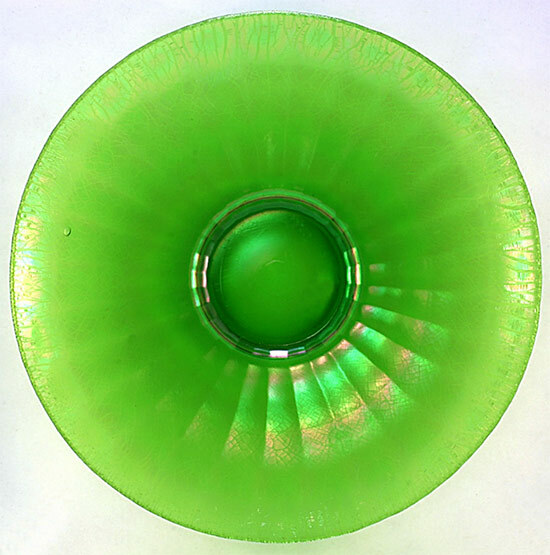 My absolute favorite emerald green piece is Northwood’s #631, 11.5-inch diameter plate with the rays!